The Bush Compound Kennebunkport Maine is a photograph by Brian MacLean which was uploaded on July 25th, 2016. 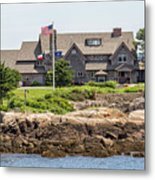 The Bush compound is the summer home of 41st President of the United States George H. W. Bush. It is located on Walker's Point (previously known as Point Vesuvius. Walker's Point juts out into the Atlantic Ocean in southern Maine, in the town of Kennebunkport, Maine. The property has been a family retreat for more than a century. The estate is situated on a promontory of land called Walker's Point which juts out into the Atlantic Ocean. 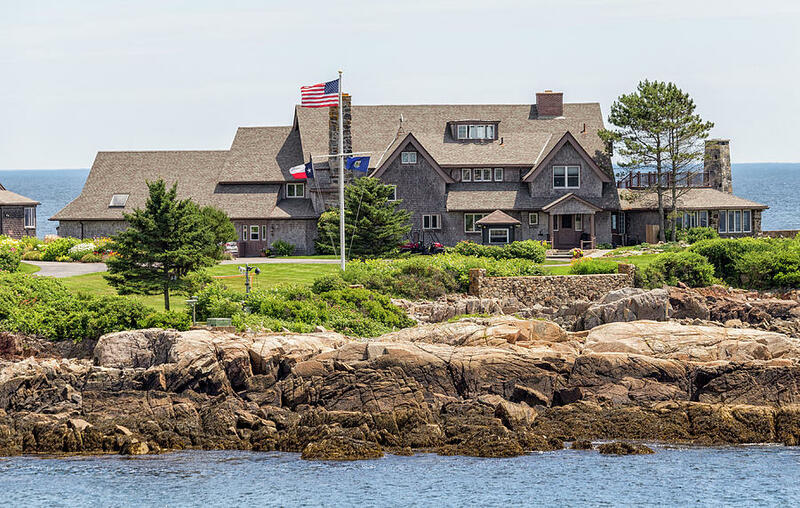 The large central house, built in the New England shingle style, has nine bedrooms, four sitting rooms, an office, a den, a library, a dining room, a kitchen, and various patios and decks. 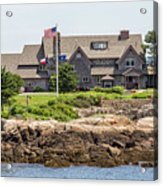 Next to the main house are a four-car garage, a pool, tennis court, dock, boathouse, and guesthouse. There are spacious lawns on either side of the house, on which there is a small sportsfield. The entrance is gated and guarded by Secret Service officers, though visitors can see the driveway leading up to the main house and a circular driveway, in the middle of which is a large flagpole flying the American flag. 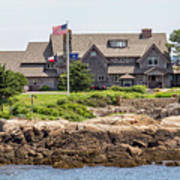 When either President Bush was present at the compound while in office, the Presidential flag was hoisted below the national colors; the flagpole was a popular backdrop for television journalists during the elder Bush's presidency. There are no comments for The Bush Compound Kennebunkport Maine. Click here to post the first comment.